In 1996, the movie Twister came out, and it introduced me to the idea of a storm chaser. This concept of someone who deliberately went towards a storm — chasing after it, even — seemed a little peculiar to me. I, like many of you, prefer to run in the other direction when a storm hits — to hide. And not just physical storms, but emotional storms at that. However, there are actually people who enjoy the thrill that comes from chasing a storm — being near it, documenting it. In Scripture, we see many storms, and just like you and me, most of the people we see within its pages try their best to get out of the storms of adversity. Esther didn’t exactly want to go and make a request of a king. Moses tried to back out when God called him to confront Pharoah. Jonah ran away when God asked him to witness to Ninevah (but ended up in a storm anyway). However, we see that God often calls us to places that are hard and difficult. Places that will shake our faith and cause us to be uncomfortable. 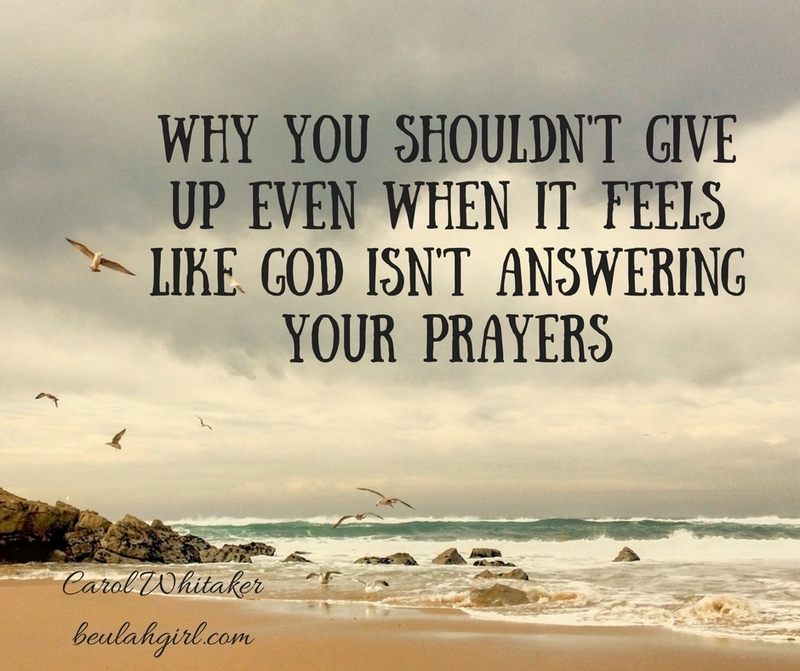 But He doesn’t call us to do it because He doesn’t love us or because He is like some of the crazy thrill seekers that call themselves “storm chasers.” No, He does it because He knows what we need to grow as Christ followers. We need only look at Mark 6:45-51 to observe a place where Jesus sent His disciples onto a boat ahead of Him onto the Sea of Galilee, knowing that there was going to be a storm. He had just performed the miracle of the five thousand loaves. Things were going pretty good for the disciples, but then things got dark pretty quick. A storm blew up when they were on the boat alone without Jesus, and they were tormented by winds that were against them — making headway very difficult. 1. His directive may be for our protection. We must note that Jesus was actually getting His disciples away from crowds that were scheming to make Jesus king. Jesus knew that the intent of the peoples’ hearts was far away from the purposes of God, so He instructed His disciples to get into a boat (Wiersbe [John] Bible Commentary). He dismissed the crowd and went away alone to pray. This, however, wasn’t without some resistance on the disciples’ part. The wording suggests that the disciples had to be somewhat persuaded to get in the boat without Him. Perhaps we only see the storm ahead of us that we are currently in and we look longingly back at whatever situation we just walked out of, not realizing that perhaps God moved us on for our safety. Perhaps the relationships we wanted so badly to work out, the opportunity we wanted to see open for us — God led us away from that not because He didn’t want good for us, but because He was keeping loving watch over us and had a better place in mind for us to go. 2. God sees you in your situation. Even though Jesus left the disciples to row alone across the Sea of Galilee, the disciples were never out of his “sight,” so to speak. As the Jamieson-Fausset-Brown Bible Commentary notes, Jesus “saw” from His mountaintop. We often think that because we can’t immediately see Jesus in our situation that He has abandoned us. However, we can clearly observe in this passage that God always sees and God always knows. Just at the right moment, when the disciples had been rowing for eight or nine hours against contrary winds, Jesus appeared to them. Just like Jesus waited to come to Lazarus until he was already dead, Jesus waited until His disciples most likely felt that their situation was utterly devoid of hope. We may feel like Jesus has waited too long and our situation is already hopeless, already impossible to resurrect. But Jesus was aware of the situation even when He was high on the mountaintop, but let His disciples be tried to a certain point before He came to them at the appointed time — in the fourth watch of the night. 3. God is fully in control of the situation. When Jesus finally came to them, He walked on top of the waves towards the boat. The disciples had been toiling at their rowing for hours and had made very little headway, yet it was with the greatest of ease that Christ walked to them on the water — elevated above the chaos, in complete command of the situation. They disciples didn’t recognize Him at first. They thought He was an apparition and then He spoke and said, “Take courage! It is I. Do not be afraid” (v. 50 ). Even though they had walked with Him for some time and knew Him as a friend, they were slow to comprehend that it was their Savior walking towards them. And when they realized it was Him, they welcomed Him into the boat and were utterly amazed at their “awful nearness to One whose ‘way is in the sea,’ and whose ‘path is in the great waters,’ and whose ‘footsteps are not known’ “(Pulpit Commentary). We can think that He doesn’t know what we are going through. We may be praying and hear nothing, or read Scripture, and have nothing stick to us. We keep straining at the oars wondering if God even knows what we are going through, and then He speaks and lets us know with absolute certainty that He knows exactly where we are. Because God may be silent for a time does not mean He isn’t working in the background or fighting battles for us that we can’t even see. If we don’t hear anything or He doesn’t come immediately in the way we think we should, we need to listen on the ramparts for Him (Habbakuk 2:1) — and trust that not a single sparrow falls without His knowledge (Matthew 10:29). 4. His intent all along was to get them over to the other side. In the John 6:21 account, the disciples “immediately” got to where they were going as soon as they welcomed Jesus into the boat. Some commentaries I read assert the idea that perhaps this was another supernatural happening of the night. That not only did Jesus feed five thousand, walk on water, enable Peter to walk on water, and calm the storm — all in one day and night — He enabled the boat to reach the shore with miraculous speediness. Whatever the case — whether they were able to reach the other side swiftly simply because the storm died down or because Jesus enabled another miracle that night, we see Jesus’ intent for them all along in sending them out to sea: to get to the other side. We can be assured by this then that whatever adversity God sends us into is always that which has an end goal — our final destination is never to be left in the storm. Why, then, the storm? I don’t know all the reasons we have to suffer the trials we do, but I do know this. He sends us into storms for our growth, to increase our faith (Pulpit Commentary). As every good parent knows, a child will not mature as long as you do everything for him. The sole reason my five-year-old son is not very adept at putting his own clothes on is that I have always done it for him. All those mornings when I had to get him off to preschool, it was much easier for me to clothe his sleepy body instead of making him dress himself. But he struggles to put his clothes on now because he hasn’t had much practice. The storms of life are not easy. They test and try us and make us wonder if God even knows what we are going through. But we can rest assured that God will not leave us to our rowing forever — that He sees us from His mountaintop — and has an appointed time for which He will come and cause the waves and the winds to cease. Then, just like the disciples, we will fall on our faces and exclaim, “Surely, you are the Son of God” (Matthew 14:32). Surely you are Jesus because no one else could save me from this. Surely you are Lord because I was beyond help. Surely you are Lord because no one else could have orchestrated such an escape. Take heart, friend. He sees you in your storm. Want to join in a chat about life’s storms? I will be discussing the points in this post (as well as throwing in a few extra details). You can subscribe for free to our live video chat this Monday, August 15 @ 9 p.m. EST, watch the replay, or leave a comment below. UPDATE on BLAB CHAT: Blab has been closed down! We are so sorry, but this chat will not be taking place. We will be looking for a new means to host our Monday chats. Do you like confronting others? I certainly don’t. As a recovering people-pleaser and person who has worked hard to overcome an addiction to others’ approval, I have struggled to confront people or initiate hard conversations with the people in my life. My tactics most of the time have included avoiding the situation or the difficult person. I was operating out of the wrong idea that Christians have to be nice all the time. “Nice” meant that I couldn’t upset someone or create conflict with another person because if I did, and they didn’t like it, I felt guilty and took the blame on myself for their angry reaction. However, that was a wrong mentality. Jesus had conflicts with people all the time and often said things that made people very upset (to the point that they wanted to kill Him). However, He lived a perfect life and never sinned. Why Am I so Afraid to Confront People? My hesitancy to confront others has been a symptom of my people-pleasing disease. At the root of my approval-seeking is a fear of rejection. The disapproval of others is something I avoid because I avoid rejection at all costs. However, never initiating a hard conversation or confronting someone about an action is not a realistic or healthy way to live. Conflict is inevitable and even necessary with those around us and closest to us. I have since learned that we should focus on handling conflict and confrontation correctly, rather than attempt to avoid it. That, yes, God does not want us to allow others to simply do as they please around us. However, whenever we have to talk with someone or call them out on a behavior, we should do so with the right motives and do so in love. 1. When someone wrongs us. When someone sins against us, and we are hurt by their actions, it is necessary in some cases to go to the person and let them know they hurt us. Yes, there are some instances where we should overlook an insult, but there are other instances where it is imperative that we let the person know that they hurt us. Obviously, you will need the wisdom of the Holy Spirit in regards to this, but the Bible is clear that if someone offends or wrongs us, we need to take a direct approach and address it with the person (not run around behind the person’s back and tell everyone how much his or her actions upset us). 2. When we see a fellow Christian in sin. Again, you will need the Holy Spirit’s wisdom in this area, but there are times when we will need to speak to another Christian about a sin issue in their life. We need to carefully check our motives before doing this and make sure we are not approaching the person from a posture of pride, but the Bible says we have a responsibility to help restore another believer back into right choices. Our motive in these cases should always be restoration rather than condemnation, and we have a responsibility to approach the individual with humility and grace — rather than accusation. However, rather than stand by in silence, we need to speak up and point out the sin and what it says in the Bible concerning it. 3. When we need to set a boundary in a relationship. I think of “confront” as only meaning to point out a wrong to someone; however, “confront” can also mean “to deal with (something) in a direct and honest way” (Merriam-Webster Dictionary). Perhaps we have a dominating friend who always talks over us. Perhaps we have a spouse who never asks for our input in financial situations. Perhaps we are under the leadership of someone who doesn’t communicate expectations clearly. 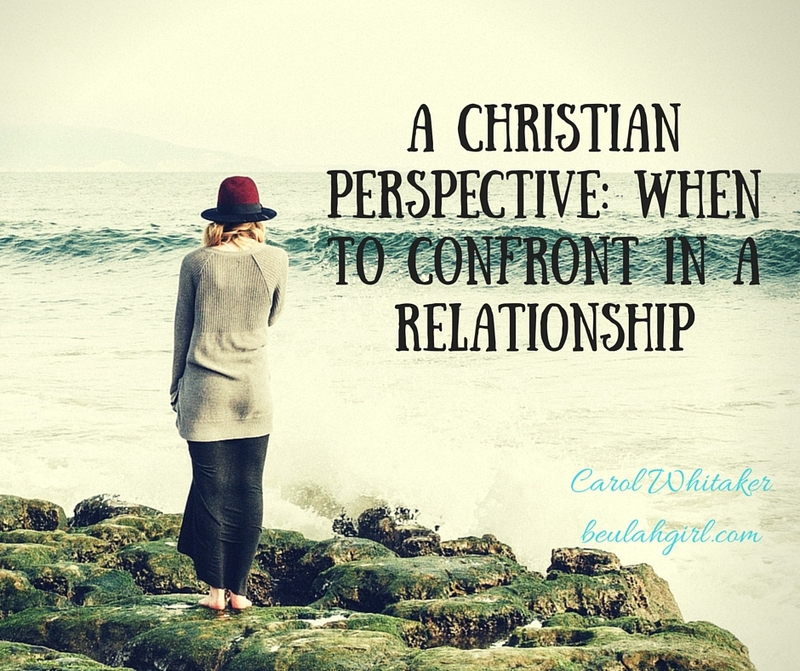 The confrontation may be us starting a conversation with the other person about our needs in the situation or how the person’s actions (even if they aren’t necessarily sinful) make us feel. Maybe we find the idea of broaching the subject scary because we don’t know how the other person will respond, and we are afraid that we will lose their approval. We don’t have to convince the other person of our view. They may not want to turn away from their action or agree with us. However, bringing up the conversation is freeing for us. We aren’t bottling up our emotions inside or denying our needs in a situation. Confrontation is difficult and something most of us don’t enjoy doing. However, confrontation helps us set boundaries in our relationships by making it known to the people around us what our needs and feelings are — and if they have crossed the line or hurt us. Confrontation is also a biblical mandate. Being part of a community of believers means also helping one another to live in a way we’re supposed to. This means helping one another when we stumble — but also accepting help and letting ourselves be held accountable by others. Are you afraid to speak your needs or say no to the people in your life? To join in for a discussion on confrontation, subscribe to our free video chat this Monday, July 18, @ 9, or leave a comment below.